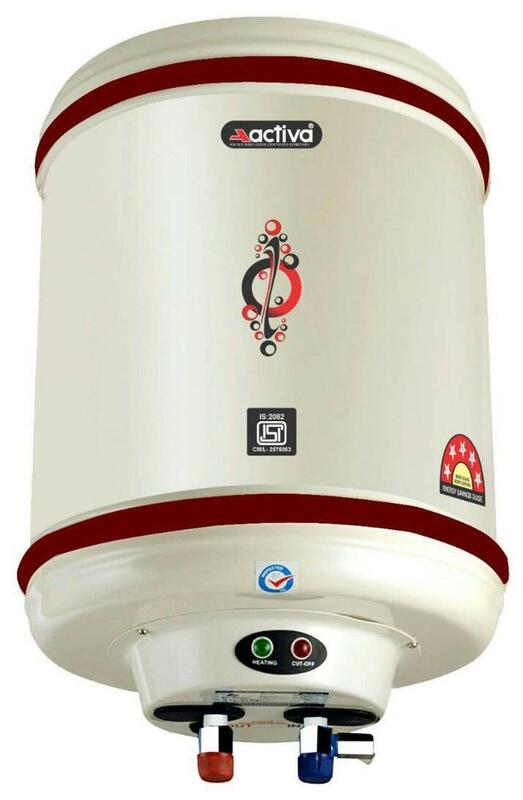 Overview # The Activa Hotline 25L Water Heater is a range designed to fulfil the needs of comfortable and hassle-free hot water supply to homes. An affordable economical range this 25-litre capacity geyser serves the needs of a mid-sized family easily. This instant water heater doesn t take much time when doing its work and comes with a 1-year warranty on its electrical component. Available for the best market price deal order it now from for a doorstep delivery. # Capacity # This 25-litre capacity geyser has ample capacity to serve a mid-sized family. Its inner tank is corrosion resistant to hold the water safely. The inner tank in the geyser is the heaviest in its category allowing maximum water heating at a go to serve your whole family. # ISI Marked Heating Element # The Activa Hotline 25L Water Heater has been given an extra heavy heating element. This heavy element gives longer durability to the water heater. This durability doesn t come without safety which is why an ISI marked heating element has been added. The thermostat as well as cut out is also ISI marked. The geyser comes with magnesium anode that can resistant hard water for years to come. # Heaviest Tank With Powder Coating # The tank is the main element of this water geyser which the tank s body has been made from high processed powder coating. This makes it a corrosion resistant geyser. The inner tank is an extra thick capsule that provides great insulation and holds water pressure. The heavier the tank the better allowing it to be easier installed at even 4 level storey buildings. # Preset Thermal Cut-Out # The Activa Hotline 25L Water Heater other than being an instant hot water supplier is also a great a smart appliance. This geyser has an automatic overheat cut off where the power supply is shunted once the geyser heats the water to its boiling point. # Power Consumption # Always go for energy saver geysers just as this 5 star rated energy efficient geyser. To provide you a good amount of hot water supply this geyser consumes up to 2000w and shuns power supply to avoid overheating and damage to the geyser. # Pressure Release Valve # With its anti-vacuum system the Activa Hotline 25L Water Heater allows no pressure building and has a built-in pressure release valve. # Other Important features # This is an elegant design geyser to match your bathroom and is the best economical range available in the market. # The images represent actual product though color of the image and product may slightly differ.